Reproduction ensures the survival of a species, and nature has planned several strategies for it. In the case of small eggs produced in large quantities, these are often transparent, in an attempt to hide them from their predators. Sometimes reproduction takes place in a communal tank, catching the aquarist unawares. As for large eggs, if there are only a few their parents protect them most of the time. In both cases, the aim is to reduce the number of losses as far as possible. 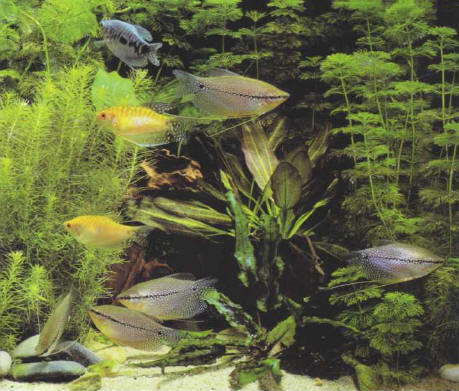 In an aquarium, the intervention of the fishkeeper considerably increases the chances of success, and the survival and proliferation of a species is normally guaranteed. These vary according to the different families of fishes, and they will be discussed in greater detail in the "Catalogs of Fishes" (pages 75 and 126). However, it is possible to advance some general precepts on the subject here. 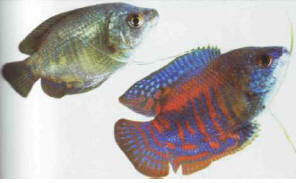 Reproduction can occur spontaneously in a mixed tank, or in a specialized or "regional" aquarium. This often happens with novice aquarists, unaccustomed to spotting the approach of egg-laying in a female. In such cases the future of the fryis a matter of chance. Some of them will serve as prey for the other inhabitants of the tank, and the survivors are sure to have problems in getting enough to eat. since they have to compete with adults. This is why it is advisable to use a tank specially intended for reproduction. Although it is sometimes difficult, at the best of times, to distinguish between males and females, it is easy enough to spot a female's swollen stomach and the attentions bestowed on her by one or several males - signs of the approach of the mating season. It is therefore time to transfer the fish in question into the rearing tank prepared for this purpose. The selection and feeding of the parents are important factors in successful breeding. Here, a pair of Colisa lalia, the male is on the right. ШПИЛЬ (нем . Spille),..1) вертикальное остроконечное завершение зданий в виде сильно вытянутых вверх конуса или пирамиды, увенчанных флагом, скульптурным изображением и т. д...2) Шпиль (нидерл. spil), см. Кабестан.